Sensory bins are a great way to engage students with a high interest activity that can be easily incorporated into your day. I love to use this Recollections storage container that I purchased from Michael's Craft Store as a portable sensory bin that has a storage tray inside. The storage tray makes it so convenient to switch out the items in the sensory bin at a moment's notice. My sensory bin may have sand, water beads, rocks, cut straws, or colored rice/pasta within it. 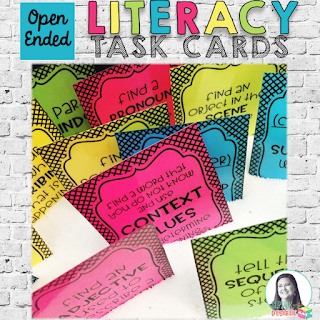 One way I love to incorporate literacy into my mixed groups is by using Open Ended Literacy Task Cards in my Sensory bin. I have several mixed groups so I print each target group on a different color of paper so it is easy for me to differentiate between target goals in my therapy sessions. One less task to juggle during one of those "all hands on deck" mixed groups does wonders to save my sanity. You can check out how I created a colorful sensory bin using pasta in this video here.